The Chandler Travis Philharmonic has kept a low profile the past couple of years while Chandler has enjoyed developing two great new bands, the Catbirds and the Chandler Travis Three-O (the latter being a smaller, satellite version of the Philharmonic -both delivered critically acclaimed debut albums in 2013), but we're back with a vengeance in 2015, with two new albums: "Bocce & Bourbon: The Comfortable Songs of Chandler Travis & David Greenberger" coming in March; and "Waving Kissyface Vol. 1", coming this summer or so. 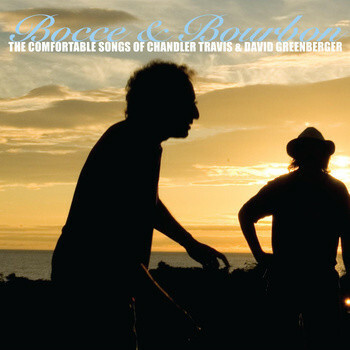 "Bocce & Bourbon" is, on the one hand, a compilation of 19 examples of Chandler's best work with his favorite lyricist, David Greenberger (also of Men & Volts and Duplex Planet fame), that spans more than three decades and includes both the Chandler Travis Philharmonic and Three-O as well as the Catbirds and the Incredible Casuals; but about half of it (nine new songs, plus a re-imagined alternate version) is brand new. The lyrics share compassion, warmth, and inventive imagery, echoed in music that is gently but firmly idiosyncratic, and the whole is surprisingly coherent -hard to catagorize, perhaps, but not hard to get. We're very proud of this collection, and the CTP and 3 both plan on touring and spreading the word as extensively as possible for rest of 2015. I hate to admit it, and I'm only going to say it once, but all of my best songs were written by David Greenberger, who is also younger than me. He's been a constant annoyance for decades.